Baseball's amateur draft is a risky bet to begin with -- only about 17 percent of signed draft picks ever make it to the majors. But high school pitchers are the riskiest bet of all. That, plus the suddenness of his rise and fall, may be what sealed the legend of Brien Taylor. Taylor, a shy, 6-foot-3 kid from a double-wide trailer in coastal Beaufort, N.C., was the last high school pitcher selected No. 1 overall in baseball's draft. The New York Yankees -- yes, they held the first pick in June 1991 -- had visions of a left-handed Pedro Martinez or maybe a harder-throwing Randy Johnson. Taylor never ended up joining his one-time spring training roommate Derek Jeter on the Yankees' dynasty teams. 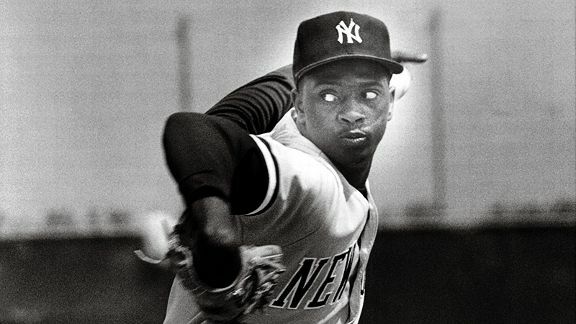 Still, some believe he was the greatest pitching prospect in the history of the draft. As baseball prepares for Thursday's first round -- in which high school pitcher Brady Aiken could be taken with the No. 1 overall pick -- this is the story of Brien Taylor, Scott Boras, the Yankees and the 1991 draft. "Bill Livesey is one of the greatest scouts of our era. He told me the best amateur position player he ever saw was A-Rod (Alex Rodriguez). The best amateur pitcher he ever saw was Brien Taylor." "His arm slot was exactly like Randy Johnson's, not sidearm but very low three-quarters. They had the same exact arm slot, only Brien Taylor threw a little bit harder." "I remember Brien threw a pitch in a high school game. It started in and moved out and it still stayed in the strike zone. The catcher completely missed it and the umpire called it strike three and appropriately so. He was a true phenom. "I've seen the talent now in 35 drafts. Every year, I watch and I have never seen someone like him." "He had everything you are looking for -- size, strength, athleticism, body type, loose, live arm, the ability to spin the ball. I think the high school game I was at, he topped out at 98 [mph]. It could've been 88, the ease at which he threw. You couldn't tell how hard he was throwing, he threw so easily with so little effort. He was the total package." "We had a meeting at a hotel in Arizona in January of 1991. We brought in all of our cross-checkers. Outfielder Mike Kelly was a great outfielder at Arizona State at the time. We just told our guys, 'This is the top college player in the country. Your job this year is to find somebody better. If we don't, Kelly will be our pick.'" "I first heard about Brien when he was a junior in high school in 1990. I went down and I watched him pitch. He just had an electric arm. A lot of kids in high school throw hard, maybe 92-93. At that time, he was throwing right around that, but the key thing about Brien was the late movement of his ball. He threw downhill. It got to the plate and it just exploded. "I watched him pitch one game and then I watched him pitch another. I began the process of talking to his mother, Betty, who was a delightful lady. She worked at a seafood operation where she cracked crab. She removed the crab meat from the crab shells. Mr. Taylor was a bricklayer. He had the hands of a bricklayer, a big, strong man. "So she invited me to come to their house and talk to Brien. I remember the road to their home. They had a double-wide trailer. I went there in the middle of the summer. It was really hot and humid. There was no air-conditioning. There was a single light source, a wire that hung down from the roof with a light bulb." "In February of 1991, our North Carolina scout, Jeff Taylor, called and said, 'I'm following up on our conversation in Arizona.' I said, 'Whattya got?' He said, 'I've got a left-handed pitcher in North Carolina.' Wow, he started to rave about him." "There are two things you can't teach in a pitcher. One is size. You can't make a kid 6-foot-3. Another thing is arm strength. You can't create arm strength. The other things -- the curveball, the delivery, the changeup -- you can improve upon. But you can't teach size and arm strength. That's the given. That is what Brien Taylor had. He had size and arm strength." "[Yankees owner] George Steinbrenner had been involved in a very sordid and unpleasant effort to discredit David Winfield. I had investigated what Steinbrenner had done. We had hearings. Steinbrenner testified at those hearings. He admitted he did some very bad things. "Mostly, he tried to ruin David Winfield by ginning up an investigation, by claiming that Winfield had violated the tax laws and a variety of other things. "In order to get dirt on David Winfield, Steinbrenner had paid a two-bit gambler named Howie Spira $30,000 one time and then another $30,000 because Spira claimed he had very bad information on Winfield. "It turned out that Spira had nothing and when I investigated, Steinbrenner admitted it was a terribly stupid thing to pay off a gambler instead of coming to me, so I met with Steinbrenner in 1990 and I told him I was going to suspend him for two years." "It was a transitional time for the Yankees. Stump Merrill was the manager and they were just rebuilding. That was when they were deciding to go with the young kids and they weren't signing free agents. They were taking their blows." "We lost 18 or 19 draft picks in the '80s due to signing free agents. One year, we didn't pick until the fourth round; most years we didn't even have a first or a second. "It was rare that we had the No. 1 pick. It was something we did not want to do again." "That was the uniqueness of it: The Yankees had the No. 1 pick. That is what I kept saying to Mrs. Taylor. I said, 'This may never happen again.' "
"Normally, as a GM, you don't usually go see a player like that yourself, even if you have the No. 1 pick. You have minor league people who usually take care of that stuff. But the minor league people asked me to go ahead and see him because Scott Boras had become what really, in essence, was his agent. I saw him pitch his last two games in high school." "The one thing I knew, there was no one else in the draft that was close to this young man's ability. That was clear-cut. I had watched all the players. "Mike Kelly was at Arizona State. I watched him play. It was not even close if you were going to go out and pick the best player in the draft, Brien Taylor was so far above anyone else." "He was hands-down the No. 1 prospect in the country. It was a no-brainer. I saw a couple of them on video. From what people told me, what I knew and what I could see, it was a no-brainer, we didn't have any doubts about it. We were going to pick him No. 1." "Even back in those Stone Age days, we had some film of kids and I saw him. I think he was rated just as he should have been in that draft class. We were focused on assuming that they wouldn't pass on Taylor and preparing ourselves to take the guy we liked next, which was Mike Kelly. We were happy with that pick. We thought he was a real strong athletic guy, who could run, could throw, could do everything." "George Steinbrenner was out of baseball at that time, but he made a statement that went public that if we didn't sign Taylor, 'Someone should be shot.' The someone was me." "That was George being George. George was not permitted to have anything to do with running the team. I would certainly say that was close to being out of bounds." "It didn't help the negotiations when from the outside George stated publicly that we better sign the kid. That obviously gave leverage for Boras." "I also knew that Brien had a reading disability so we had to create an option for him, which was junior college, so he would have a place to pitch if in fact he couldn't receive the appropriate bonus." "I didn't believe Brien Taylor was going to go to college. I thought he wanted to sign professionally. I think our organization became a little frightened. I wasn't worried about what George had said." "I just had gotten Ben McDonald, a college pitcher, the first multiyear, major league contract for a drafted player in 1989. In 1990 the big deal was for Todd Van Poppel, a high school pitcher. That was most relevant for Brien. Van Poppel got a three-year major league contract with Oakland. "The one thing I was confident about is that Gene Michael is a tremendous evaluator. He really, really knows the game. Gene Michael was not letting this player go anywhere, as long as we were not unreasonable. "The issue was that Todd Van Poppel got $1.25 million and a major league contract, and we put an evaluation on what the value would be without a major league contract at $1.5 million. The talent level of the player was something that was above Todd Van Poppel." "That was a mistake. No high school kid should get a major league contract because the chances are they are not going to be ready. There aren't many Bryce Harpers coming out, being ready on a major league contract. Bryce Harper was ready right away. That's a freak thing." "Because we were involved early, we went to his teachers in high school and we then talked to his school counselor. We then talked to teachers at Louisburg Junior College in North Carolina. We really wanted to set forth a plan where Brien was going to be able to execute a college education, knowing under the rules that junior college players can be drafted every year. So we assumed that if the deal didn't get done with the Yankees, it certainly would have gotten done the next year. The minute he attended class, the Yankees would have lost their rights to sign him." "We felt we were going to pay him around $750,000." "There was definitely an approach on the part of the team, as you would expect toward a family that is literally barely making ends meet, at the minimum for any sum of money that they thought would persuade them. "She said, 'Are you saying they are going to try to pay us on the basis of our circumstances rather than Brien's talents?' I said, 'Absolutely.' "
"I remember Scott holding him out until he got what he wanted, and he got what he wanted. I remember it being very difficult conversations. We were trying to deal with the family to make sure they were educated. Scott looked at it as a unique talent, which he was, and put a unique price on it." "When the deal went down, I was with Betty at their home. His dad, I believe, had taken Brien to school at Louisburg College. We had instructed Brien. We were waiting for the contract. Betty had given the Yankees the number, the $1.5 million. "Back then, the deadline was ours. When we attended class was when the Yankees' rights ended. Now, the deadline is a prescribed date, Aug. 15th. I looked at the draft rules at the time. It was really up to the athlete if he went to class or not. He could have told the team if he were going to class or not, and not go. Then, he would receive their top offer and evaluate it. Or he could go to class. The team had no way of knowing. "Betty told the team he was going to class. I believe it was a 10 a.m. class. He was at the school. I know that one of his classes was history because there was concern with his reading disability and one of his counselors thought that would be a good subject. The college was great. They did a very thorough job of testing him and evaluating him. They had no problem. "The Yankees offered $700,000 and said that was their final offer, and then they came up to $1.55 million." "When we did sign him, we were in the Yankee Club at the old Yankee Stadium and Tony Kubek went up to Scott Boras afterward and said: 'Scott, how much did you think that statement that George made, how much money did you think that made for you?' Tony told me that Scott said, 'About $750,000.' That was the other half of the double. We paid him $1.55 million. "I said, 'What are you talking about? If it were you, you would have given him more money.'" "The Boss took both sides. He basically said we better sign this guy. Then he ripped Stick at an owners' meeting for signing the guy. It was vintage Boss. He was never wrong." "He went out that first year in the Florida State League and was pretty dominant for an 18-year-old kid who didn't really play real good high school baseball. He was very dominant. The average time of his fastball for the whole year was 95 miles per hour. The minor league people told me. No one else could do that." "The other thing that was unique about him was this guy had a following. This kid would go sit in the stands and try to do his work and there were all kinds of people coming to get his autograph. There were people after the game, outside of the buses. He had a cult following." "I saw him in the Florida State League. He was as good-looking a prospect as you'll ever see. He was 97-98, left-handed. He looked like he was going to have a great slider. He was a can't-miss. He had the perfect body. That is what the great ones look like. "Those are the guys -- Doc Gooden, Kerry Wood, Josh Beckett, Taylor -- when you go see them, you know you have something special." "He was rough in the fundamental areas when we got him. The guys in the minor leagues said, 'Geez, he can't hold runners on.' I said, 'Geez, there has never been anybody on.' "
"For Brien Taylor, it wasn't a question if he were going to be dominant in the major leagues. It was just a question of about how long before it happened." "Brien was stellar, dominant, on his way. He was going to the big leagues and was going to be all we thought he was going to be, then there was that unfortunate evening in North Carolina in 1993 that he got a call that his brother was getting beat up at a bar. "He was home in bed. He gets out of his bed. He goes over to find his brother and protect him. A guy takes a swing at him and he puts his left arm up and his hand and arm take the force of the swing. It pushes his arm back behind his head. "I take him to Dr. Frank Jobe. He looks at me. 'This is the worst rotator cuff tear I've ever seen. It is completely off the bone.' So he had to have that surgery." "If Brien didn't get hurt, we would have been very proud of that pick. He got injured by a mistake that he made, a silly mistake, in my opinion. But he did it. It is done. You can't turn the clock back." "We were roommates in spring training in 1994. He was a good dude. He was a nice guy, sort of shy from North Carolina. Sometimes one thing goes right, one thing goes wrong and it can change the course of a career. Unfortunately, for him -- and for us, as well -- he got hurt." "Brien Taylor was widely regarded as a terrific prospect, but how can you factor in the likelihood of injury? These kids hurt themselves and they disappear very quickly. Taylor was a very sad case. I always felt very sorry for him." "They did awfully well in the late '90s with the guys they had. He would have fit in with that Core Four (Jeter, Andy Pettitte, Jorge Posada, Mariano Rivera). I think the game got cheated by not seeing him. He was going to be something special." "I've heard that a number of times when you talk to scouts who have been doing this for 40 years. You like to play those games, 'Who was the best you ever saw? Who was the best position player you ever saw?' Brien Taylor's name comes up quite often. It is a shame that he got hurt because he was a left-handed version of Pedro Martinez in terms of flexibility and arm slot he was throwing from." "You know what? Brien Taylor's arm was so good, he came back from rotator cuff surgery and he still threw over 90 miles per hour, but he was no longer Brien Taylor." In Taylor's first two years of pro ball, he struck out 337 batters in 324 1/3 innings in Class A and Double-A. His ERA was 3.03. He would miss all of 1994 following the fight involving his brother. From 1995 to 1998 -- as the Yankees began their Jeter-led dynasty -- Taylor would throw a total of 108 2/3 innings in Class A. His ERA was 10.85. He was released by the Yankees after the 1998 season. He would spend two years more in baseball with the Seattle and Cleveland organizations, pitching a total of 2 2/3 innings. In November 2012, Taylor was sentenced to 38 months in prison for distributing crack cocaine. He could not be reached for inclusion in this story.